How do you plan a golf tournament when you know absolutely nothing about golf? As the best players in town prepare to fundraise for Naples’ premiere Professional Regional Theatre, the team at Gulfshore Playhouse organizing the event are taking a crash course in golf. 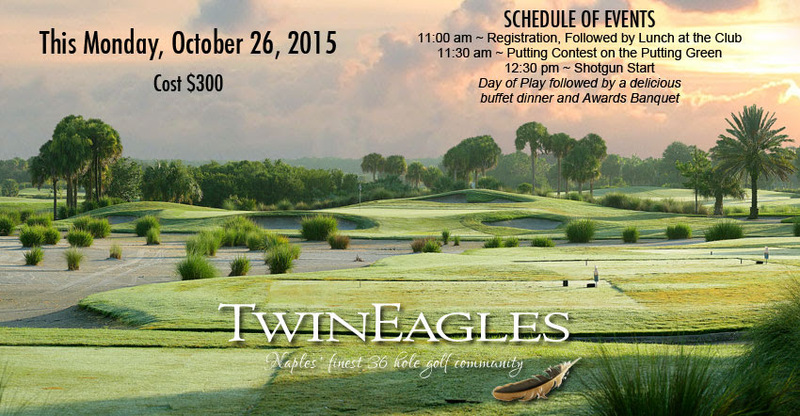 We are only a few days away from tee-off on Monday, October 26 at the stunning TwinEagles golf course. Last minute preparations behind the scenes will make it a wonderful day. But we still know very little about this challenging sport. I decided to turn to Wikipedia for answers. Apparently golf was invented in Scotland during the middle ages when a group of guys wanted to frustrate themselves by hitting the smallest ball invented across the largest field they could find into a hole the size of a coffee cup. Perhaps it got their minds off the plague. Today there are 35,000 golf courses in the world with 15,372 in the US alone. But the game is harder than it seems with 540 million golf balls sold each year for only 261,372 holes played. It is estimated 300 million golf balls are lost each year to the rough, ponds, sand traps, and perhaps between your sofa cushions. It is also the only sport with no uniform but a strict dress code. Shirts must have collars, no denim, no skirts, pleated pants, soft spikes, etc. Golfers spend 1.5 billion annually on attire which explains why my parents signed me up for swimming lessons. A bathing suit, a towel and they were done. The most confusing to me is the tools of the game, the clubs. Putters, a term that I thought more accurately described what my first car did at stop signs, can cost up to $3,000. A nine-iron, not an impressive multi-vitamin, is actually made of a pricey alloy NASA invented. Perhaps our government hopes to one day put a golfer on Mars; Alan Shepard already played a short game on the moon. There are Wedges, my favorite salad and statistically the most used clubs in the game. And finally there are Woods, sometimes made of persimmon wood but mostly made of carbon fiber, titanium, scandium, and other materials I believed are used to make the “black box” on airplanes. Our event kicks off at 12:30pm with a shotgun blast, which is always a good way to start any sport that demands calm breathing and focus. There is also a beverage cart roaming around the field during the game-something I think would make soccer a more interesting sport. We are incredibly grateful to Jack and Cheryl Solomon for donating the TwinEagles course and for hosting our event. Generous local vendors have donated prizes and other items. Volunteers have donated their precious time. The Chairman of our Board, Bob Harden, has worked on this event tirelessly for months. Our golfers are all coming out to support a not-for-profit arts organization that thrives through community engagement. I may not know that much about golf, but I have learned a lot about those who play the game. At the end of day I think they are all winners.